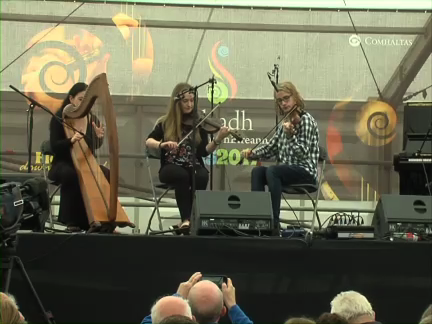 At the Scoil Éigse Tutors Concert at Fleadh Cheoil na hÉireann 2017 in Ennis, Co. Clare, L/R Eileen Gannon, St. Louis, Missouri, USA, and Eimear and Conor Arkins from Ennis, Co. Clare, play two Reels - “The porthole to the kelp” (B. Casey) and “Maghera Mountain” (Mtn. Hayes). The porthole to the kelp” (B. Casey) and “Maghera Mountain” (Mtn. Hayes).